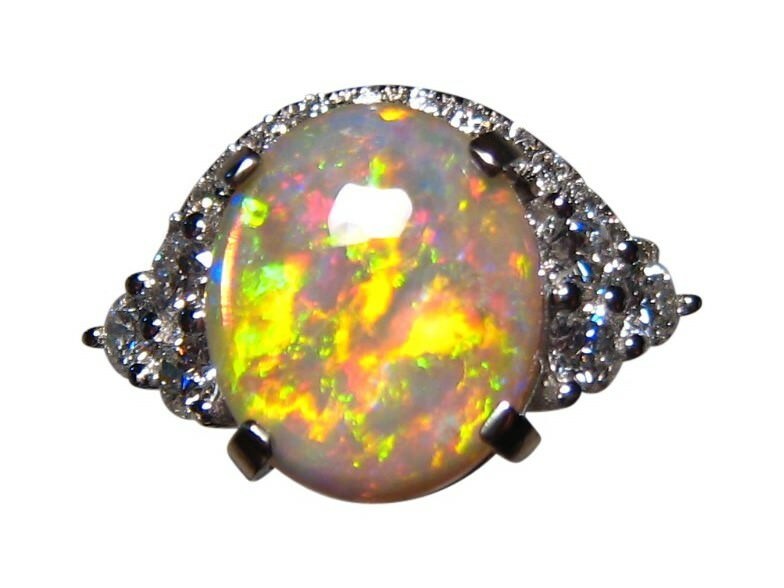 A stunning Opal ring with an extremely bright oval Coober Pedy Opal accented with six quality Diamonds set in 14k Gold. 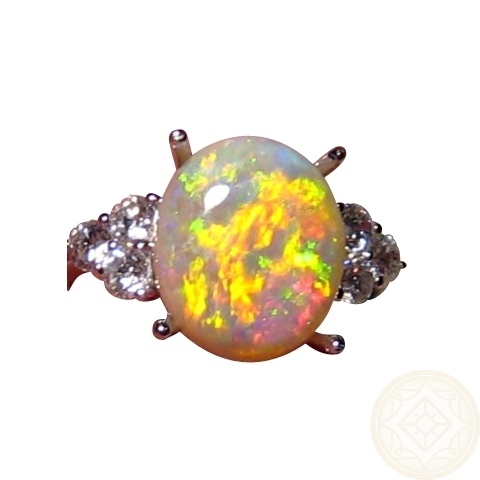 A style of ring suitable as an Opal engagement ring or to wear at any time and will be noticed when worn. 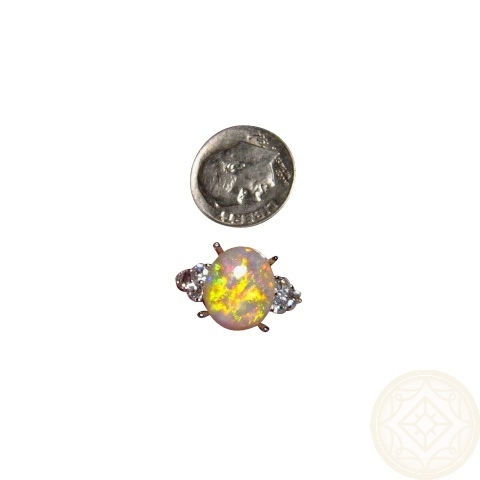 This Opal Ring with diamonds has a great mix of colors in the Coober Pedy Olympic Mine Opal. Shown in a 14k White Gold setting with three top quality 3 mm diamonds on each side, the 3.56 carat stone has a flame roll pattern which is ideal for a ring as the play of color shows off with movement. 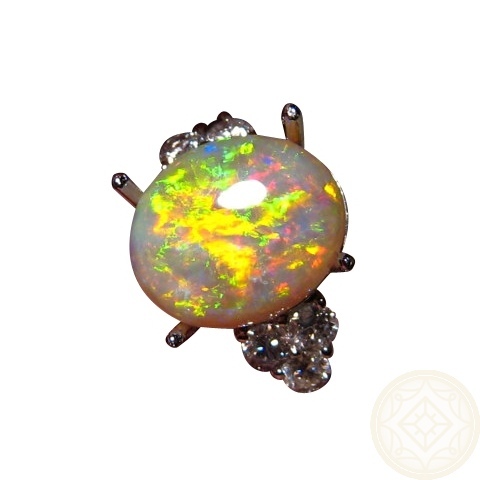 As the Opal is not fully set, it can be mounted into a different style of ring you prefer and you can inquire through this product for assistance. A beautiful ring to be worn on any occasion and can be considered as an engagement ring but please read the care instructions before deciding. 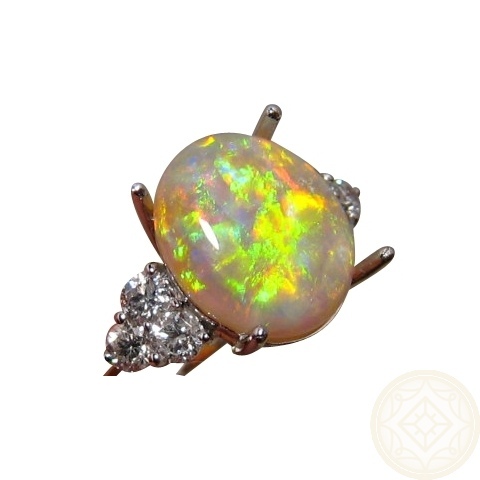 Please note that as this Opal ring has been sold, the first photo shows the Opal secured for a professional finish. It also shows a made to fit diamond wedding band and any ring you find in this store, can also have a diamond band custom made to fit. Just inquire through the product for a no obligation quote. Just received my custom made engagement ring with matching wedding band. I am absolutely over joyed and 100% happily satisfied with the beautiful stunning opal, the expertise in craftsmanship and knowledge from Kent & Janine shined all the way from beginning to the end. This couple knows fine jewelry & just how to deliver it! Thanks so much for making our engagement so very special! !